It’s been a great 8 weeks! I was super focused on getting my body back into tip-top shape in preparation for the fall when I’ll have to move most of my workouts indoors. Let’s face it, running outside 5 days a week isn’t going to be doable. Bring on the kickboxing and INS.ANITY workouts! I knew going into these 8 weeks that weight loss would be hard. I’d crept up to 146.4 in June and seemed to be hanging out there. I’d lost track of food and as we all know, you can’t out-work a crappy diet. That weight is still well within normal for my height and build (5’7 with a medium-large frame, BMI of 22.9), but it was feeling uncomfortable knowing that fall was around the corner. It was time to step it up. I set goals for core strength, but I was meeting them almost immediately, so I dropped them. I set goals for cross training, and failed miserably. But in calorie consumption, mileage, and activity time goals, I exceeded all expectations… and they were lofty expectations! 1330 net calories a day, 5 hours a week of exercise, and 20-30 miles a week of running (or hiking or very brisk walking). As far as I’m concerned, these last 8 weeks have been very successful and I’m super happy. On top of meeting/exceeding those goals, I managed to drop a very solid 4.2 pounds (my wake-up weight today after no rigorous exercise yesterday and a rather unhealthy dinner last night) and I lost 1.0% body fat (which is 4.4% of the body fat I was carrying). I also dropped a collective 1.75 inches from my frame. Going into the next 10 weeks, I have three simple goals… I must weigh 145 pounds or less every Wednesday, my body fat cannot go above 24%, and I want to keep doing 5 hours a week of vigorous activity. I chose Wednesday as my weigh-in day because my body has always corrected itself by then from the weekend before. Since I’m truly in maintenance mode (my rib cage is a solid 31 inches measured just below my breasts, and the doctor says it is impossible for it to get smaller, that this is how I’m built), a mid-week weigh-in makes sense. I’ll create a boring page for tracking purposes. I love tracking information!!! Categories: Fitness and Health, Fitness Stat-urday, Food | Permalink. We have a fantastic trail system in our community. Finding a trail to bike or run is never, EVER a problem here. The state has been working hard on expanding our “rails to trails” system and we have a very cool one just 20 minutes from our house. We have said for years that we need to go and check it out. We went to dinner, left the bikes on the rack, put the car in the garage, and had Emily stay the night. We stayed up late and watched a hilariously bad movie… Just like old times! Bryson woke up at 6:20 so we went for a 5.5 mile run while the house slept. Hottie went for a run when we got back because Matthew wasn’t up yet. Once he was home, Matthew was up and the boys were fed, so we headed out once again to the trailhead. This time, nothing but sunshine! I volunteered to tow the boys in the Burley for the first time ever. That was easy, until it wasn’t on the way back with an insane head wind… But it was fun! They did great and we were biking for a little over an hour and went 10.4 miles. It was worth the wait. The trail was beautiful and the bridge was, well, FANTASTIC!!! It was breathtaking, actually! And I finally got some cross training in! Categories: Adventures!, Bryson, Family, Fitness and Health, FUN!, Matthew | Permalink. … Hell. This trip has been so hard on us, as we knew it would be. Traveling for 7-8 nights, in three different hotels, is hard enough. But add in two young kids and it takes everything in you just to survive. I checked out my sister’s cabins today. They each have two separate bedrooms, two separate bathrooms, and a living room. We have… One room and one bathroom half the size of their small bathrooms. 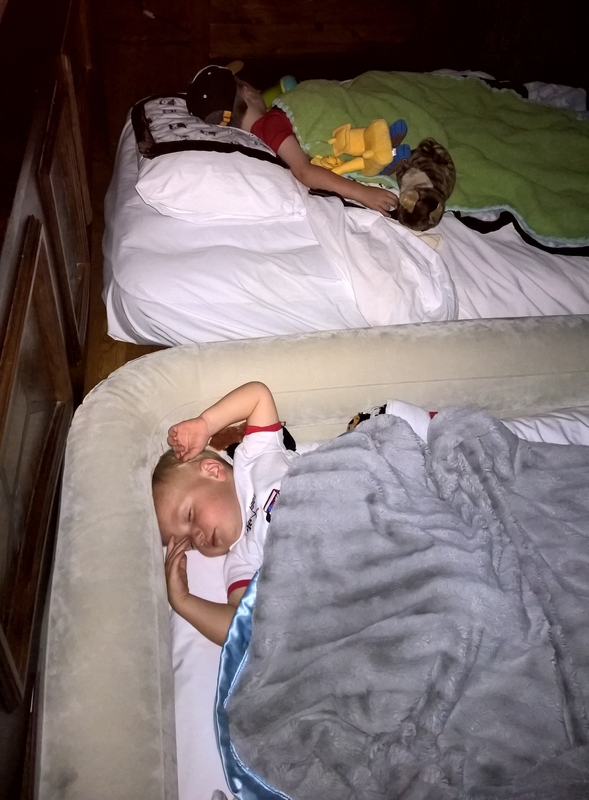 I’m not complaining because, “it’s not fair.” I’m complaining because we have no space to even walk, and we have the two youngest kids and one who requires a nap. We’ve had no place to escape to, and that is HARD. The kids get riled up and my dad has literally told us, “to wind them down,” or, “take them somewhere else.” But where am I supposed to do that when I don’t even have a room to go to to calm them down? There is literally no place to even stand since the kids air mats are on the floor, between the foot of our bed and then up against the fireplace (truly). If we go to our room, we all have to sit on the bed together. Ummm…. not relaxing or helpful. The kids are asleep and I took a quick picture because they looked cute. I’m trying to capture the good moments. This is one of them. Categories: Family, Travel | Permalink. Night one of the family trip, and my dad scheduled the big, fancy, 6-course restaurant for the night of arrival. In his defense, it’s the only night it’s open while we’re on property, but in my defense, I told him my 2 and 4 year old couldn’t handle a 2+ hour dinner. No one cares what I say. So we went. My boys were all over the dance floor and I was told by the staff they couldn’t go out there anymore. Ok. I get it. Fair enough. Then my dad told me to get Bryson under control once, then twice. Honestly…. I think we’re the winners. All tension gone. The fine clothing is hung back up, and we’re being real. Added bonus, this way of traveling and eating is totally keeping my calories in line. 6 course meal starting with pork belly (yuck!) or one cookie? Categories: Adventures!, Bryson, Family, Matthew, Travel | Permalink. This is a must-read no matter where you are in your life right now. Powerful stuff!!!! Years ago when I was at uni, a friend of mine asked me if I would go along with her to a recruitment event for the chance to work in the USA for the summer. Being an Americophile*, I jumped at the chance. I’d already worked the previous summer in the US and I was of the age (19) where I was adventurous and up for doing anything. As it turned out, the firm was called the Southwestern Company and what they did was recruit university students to sell educational books door to door during summer break in the USA. My friend decided it wasn’t for her, and ended up going and working in a US summer camp.